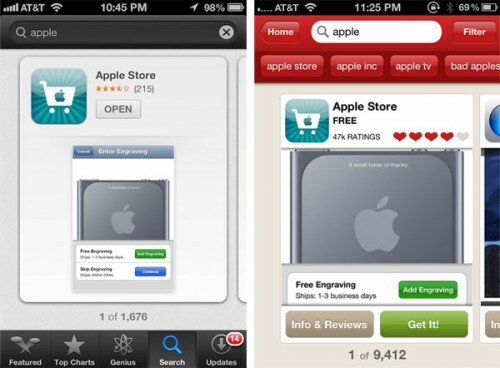 Following the introduction of the new Chomp-styled App Store layout in iOS 6, built upon Apple's acquisition of the app search and discovery platform earlier this year, Apple over the weekend shut down the standalone Chomp service. Chomp had previously been available as both website and app tools for iOS and Android, but Apple killed off the Android functionality in late April following its acquisition of Chomp. The Chomp website and iOS app remained functional until this weekend, however, when Apple removed the Chomp app from the App Store and redirected the Chomp website to apple.com. As noted in our forums, existing users of the iOS app have also been shut out, as Apple has discontinued the service effective yesterday. 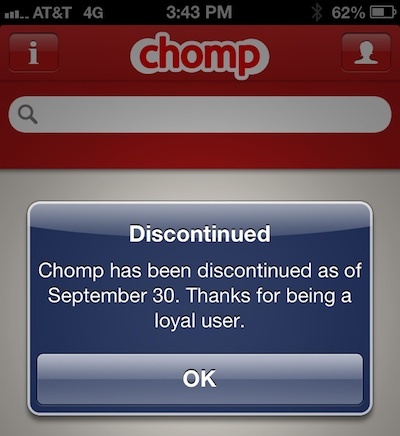 Chomp has been discontinued as of September 30. Thanks for being a loyal user. Apple's new Chomp-inspired App Store layout for iOS has drawn a fair amount of criticism, with some users complaining that search and discovery is much more difficult with the new interface showing just a single search result at a time. I'm definitely not a fan. It slows users down when looking for application as they cant view the entire list on screen. This means they might not find an application which is more relevant to them lower down the list! Also bad for app developers like me, as it makes it much harder to get noticed. So this is the app that Apple used as a model to destroy the app store? Ugh. Honestly, next update/major patch they should just fix the maps app and the app store and nothing else. They must assume people only use search to pull up a specific app. For example, I search for general terms like "twitter" or "movie showtimes" so I can browse a bunch of apps to compare and see if any of them look good. If I see this I am SO glad the Dropbox guys refused the Apple takeover. Dropbox is still owning iCloud on every single aspect (integration, ease-of-use and functionality), imagine what a waste of an excelent service it would have been if Apple got it: they would have used the tech to make iCloud more quickly than they did now, but iCloud would still have been the closed blob lacking fucntionality it is today. I agree with others it is absolutely TERRIBLE. Honestly how can they come up with worse ideas? Not only is it just slow to scroll through and find what you are searching, but in order to get accurate results, you have to type it in extremely accurately. It is just not something I could imagine from Apple, or 2012 technology. Did I mention it crashes a decent amount on iPod Touch 4G? Using that big 4" display to show one result at a time.